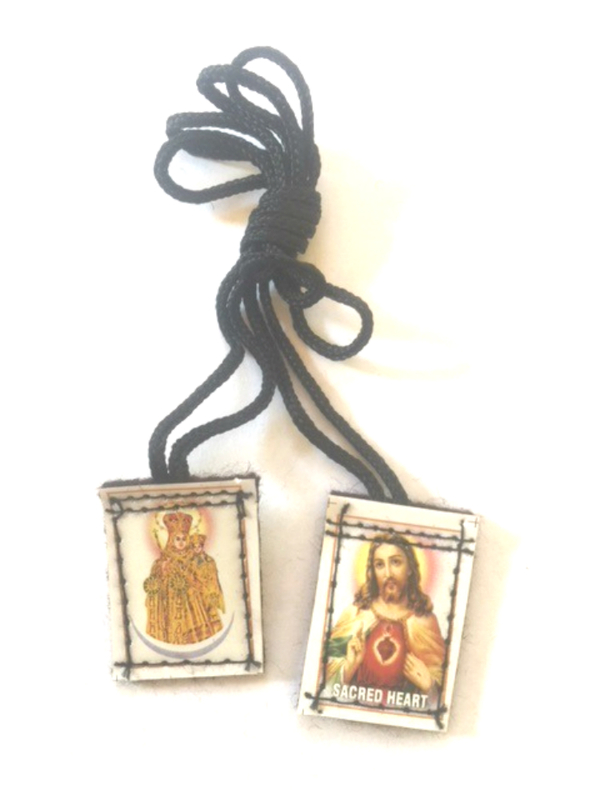 Red scapular of the Passion: This scapular has its origin in one of several appearances of Our Lord in 1846 to Sister Appoline Andriveau. In these appearances, He showed her the red scapular of the Passion, and promised that a great increase of faith, hope and charity would be reserved every Friday for those who wore the scapular. This vision was several times repeated; and the extraordinary thing about it is the rapidity with which it was approved in Rome. Blue scapular of the Immaculate Conception: This scapular has its origin in the 1605 appearance of Our Lord to Sr. Ursula Benincasa, foundress of the Theatines. He made great promises if she and her fellow nuns would adopt as their religious habit one of a light blue color in honor of the Immaculate Conception of His Mother. Sister Ursula then asked Him if He would grant similar favors to those of the laity or of other religious orders who would wear, in honor of the Immaculate Conception, a small Blue scapular; and Our Lord did so promise. Enrollment in the confraternity of the Marians of the Immaculate Conception, and specific daily practices, are required in order to obtain the indulgences. 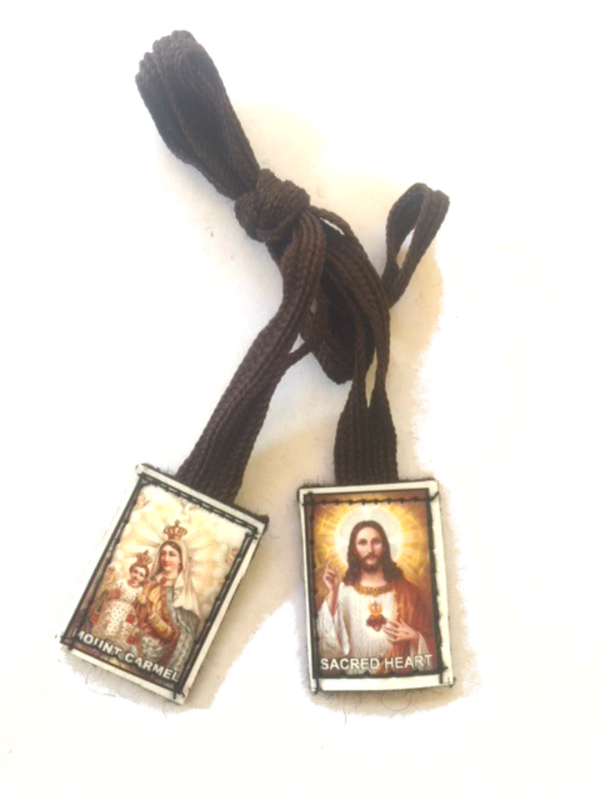 The Brown scapular of Our Lady of Mount Carmel: This popular scapular has its origins in 1247, when Our Lady revealed it to St. Simon Stock, the Prior General of the Carmelite order. Requirements include wearing the scapular after enrollment, observing chastity according to one?s state in life, and reciting the Little Office of the Blessed Virgin Mary, or reciting five decades of the Rosary daily. 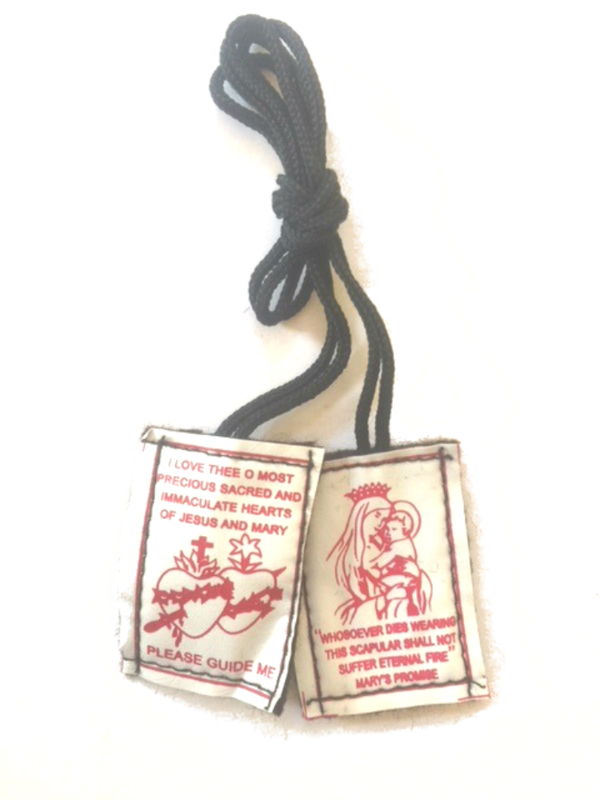 The Black scapular of the Mother of Sorrows: This scapular has its origins in the 1240 appearance of the Blessed Virgin to seven prominent citizens of Florence. They bound themselves by vows to honor the Mother of God in her sorrows. She handed them the Black habit of the Servites and said, "...these garments shall be to you a perpetual memory of the sufferings of my heart." The White scapular of the Trinity: This scapular has its origin in 1190, when St. John of Matha, a Spaniard, was saying holy Mass. He saw over the altar the figure of an angel wearing a white robe, with a blue and red cross on the breast and the shoulder. This became the habit of the order of The Holy Trinity. The attached St. Benedict's medal is blessed with the powerful exorcism prayers and is complimentary. In 1198, Pope Innocent III approved the Trinitarian order. *433 Indulgences attached to this Scapular .